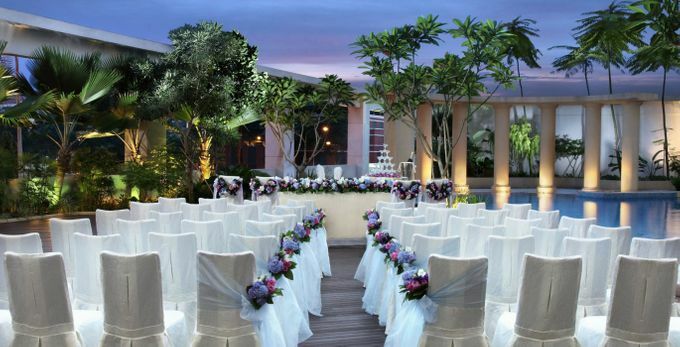 Exchange vows against breath-taking views of the verdant greens and the iconic Singapore River at the romantic outdoor Pool Deck. Or, host your reception indoor at the elegant 81-sqm Van Kleef room with glorious views of the azure pool and the city skyline. Amongst the strategic vendor services available include Stardustwithlove Bridal Shoe Atelier, Kelly's Bridals collection of wedding gowns and suits, Once A Prop A Time, boutique skincare DrSpa, SG Wedding Favors, and one of Singapore's most trusted wedding vendor directories and specialists, Bridestory. Exclusive Perks: $50 rebate per table | Free-flow of cocktails, mocktails and soft drinks during cocktail reception | Corkage fee waiver | Complimentary 1-night stay in Deluxe Room for wedding helpers with buffet breakfast for two persons on the next morning. Seize the opportunity on this showcase date to secure your 2019 event with 2018's packages and prices. Plus, stand to win over $1,200 worth of lucky draw prizes including $288 off your wedding bill and a one-night anniversary suite stay! Free admission (per-registration required). For more enquiries, contact bqt.phcq@parkhotelgroup.com or call 6593 8825 / 59.